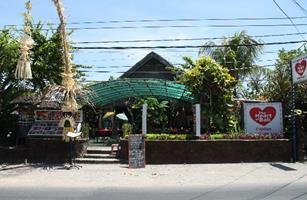 The Tao Bali Restaurant (1 review) Jalan Pertama No 96 Tanjung Benoa Ph: 0361 772902, an Asian cuisine restaurant located at the top end of Tanjung Benoa, with a beach front location. The Tao Bali serves a range of Asian, majority of the menu is Thai food though they also serve Vietnamese, Chinese and Indonesian food. 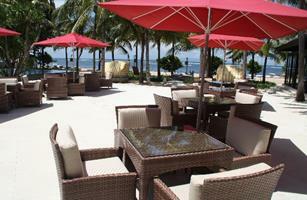 One of our favourite restaurants in Tanjung Benoa. 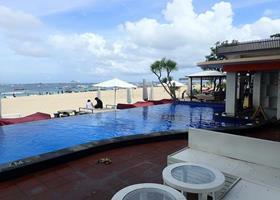 For more photos and restaurant reviews for The Tao Bali Restaurant click here. Warung Sakura Japanese Style Kitchen (1 review) Jalan Pertama No 234x Tanjung Benoa, a very small restaurant with a Japanese chef. 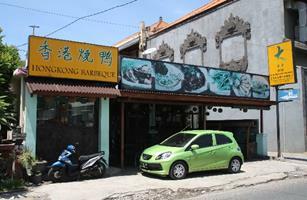 Has a range of Japanese food and local Indonesian food. With free WiFi internet. Worth a visit for the great traditional Japanese food. 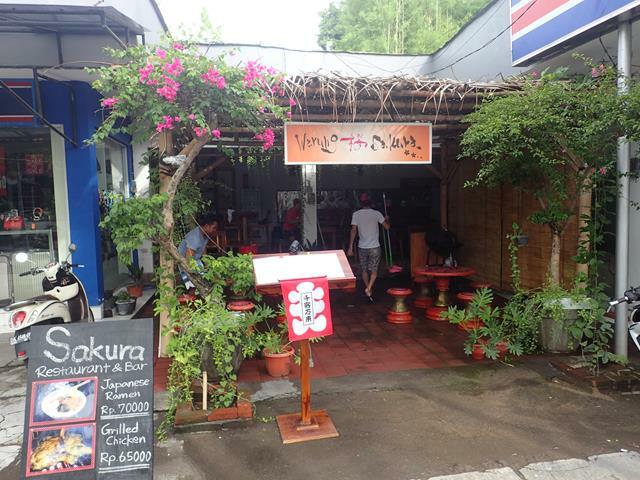 For more photos and restaurant reviews for Warung Sakura Japanese Style Kitchen click here. The Whacko Beach Club (1 review) a very cool bar and restaurant right on the beach at the top end of Tanjung Benoa. A restaurant serving Western (including wood fired pizza) and Indonesian food, a beach club environment playing cool music and plenty of watersports right in front of the beach club. For more photos and restaurant reviews for The Whacko Beach Club click here. The Heart of Bali Restaurant (reviews) Jalan Pertama Tanjung Benoa Ph: +62 8214 570 5757, located directly across from Conrad Bali Hotel. Serving a range of traditional Balinese and Indonesian food. Dishes include Balinese Suckling pig, Kakul (brown snails), seafood combination. With free WiFi internet access. 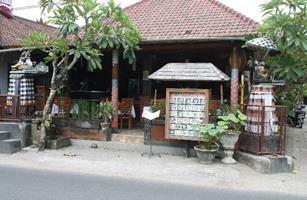 For more photos and restaurant reviews for The Heart of Bali Restaurant click here. 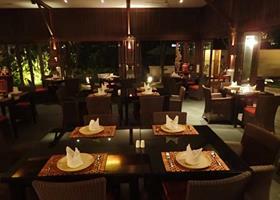 All Spice Restaurant (1 review) at The Royal Santrian Resort Jalan Pratama Tanjung Benoa Ph: +62 361 778 181. 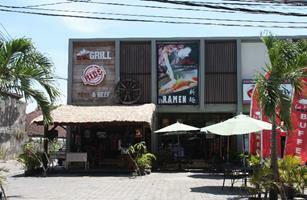 Serving a combination of Thai cuisine, Japanese cuisine and local Balinese and Indonesian Cuisine. For more photos and restaurant reviews for All Spice Restaurant click here. 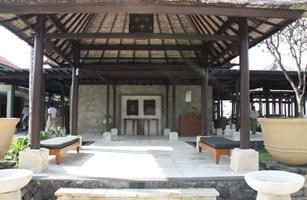 Suku Restaurant(reviews) is located within the Conrad Bali Hotel in Tanjung Benoa, just north of Nusa Dua. Suku serves a fusion of Balinese, Indonesian and Asian Cuisines. Al fresco dining overlooking the swimming pool of the Conrad Hotel. For more photos and details for Suku Restaurant click here. 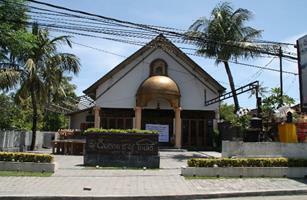 Queen's of India Indian Restaurant (reviews) Jalan Pratama Tanjung Benoa, just past Conrad Bali Hotel. Serving a great range of traditional Indian curries and tandoor. For more photos and restaurant reviews for Queen's of Indian Restaurant click here. 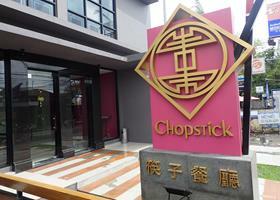 Chopstick Chinese Restaurant (reviews) Jalan Pertama No 72 Tanjung Benoa. Serving a range of original Chinese cuisine. Located at the Grand Mirage Resort, right upstairs from Starbucks. For more photos and restaurants reviews for Chopsticks Chinese Restaurant click here. 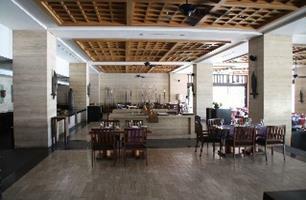 El Patio Restaurant (reviews) at the Melia Benoa Resort Jalan Pertama Tanjung Benoa. All day dining restaurant serving breakfast, lunch and dinner. Serving international and Indonesian cuisine, with American buffet breakfast, Spanish tapas at lunch and dinner. 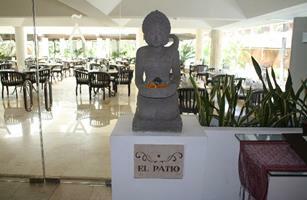 For more photos and restaurant reviews for El Patio Restaurant click here. Eight Degrees South Restaurant (2 reviews) at the Conrad Bali Hotel Jalan Pertama Tanjung Benoa. Serving a great range of Mediterranean food including pizza, pastas, chargrilled steaks and fresh seafood dishes. Open for lunch and dinner 7 days a week. For more photos and restaurant reviews for Eight Degrees South Restaurant click here. Rin Japanese Restaurant (1 review) is located within the Conrad Bali Hotel at Tanjung Benoa, just along the road from Nusa Dua. Rin serves modern Japanese cuisine tucked away next to the hotels Conrad Suites pool. For more photos and details for Rin Japanese Restaurant click here. 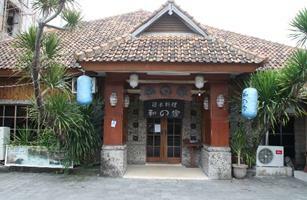 Kazunoya Japanese Restaurant (reviews) is located at Jalan Pratama No 73 Tanjung Benoa Bali - directly opposite Taman Bhagawan Bali Resort. With traditional Japanese decor, serving authentic Japanese cuisine. For more photos and restaurant reviews for Kazunoya Japanese Restaurant click here. 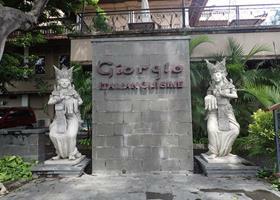 Giorgio Italian Restaurant Pizzeria (reviews) Jalan Pertama No 68x Tanjung Benoa. Serving traditional Italian food including authentic Italian pizza. Giorgia Italian Restaurant offers a free pick up and drop off service to your hotel in Tanjung Benoa and Nusa Dua. Free WiFi internet access. For more pics of Giorgio Italian Pizzeria click here. Pitanira Seafood and Grill Restaurant (reviews) located on Jalan Pertama Tanjung Benoa Ph: +62 361 778 164. 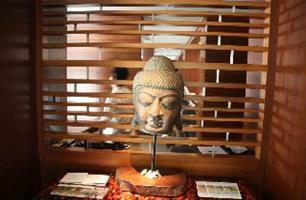 Located right next to the entrance of Conrad Bali Hotel. Serving a range of Balinese and Indonesian seafood dishes. With free WiFi internet access. For restaurant reviews for Pitanira Seafood and Grill Restaurant click here. Hong Kong Barbeque Restaurant (reviews) a small restaurant located on Jalan Pertama Tanjung Benoa serving traditional Cantonese BBQ food including BBQ duck and BBQ pork. Open for lunch and dinner 7 days a week. For restaurant reviews for Hong King Barbeque Restaurant click here. La Men Grill Restaurant & La Men Ramen Restaurant 2 restaurants next to each other specialising in pork and beef ribs as well as Japanese Ramen noodle soups. Located on Jalan Pertama Tanjung Benoa.